Ryan Reynolds was pictured on 5th October 2014 in New York City. 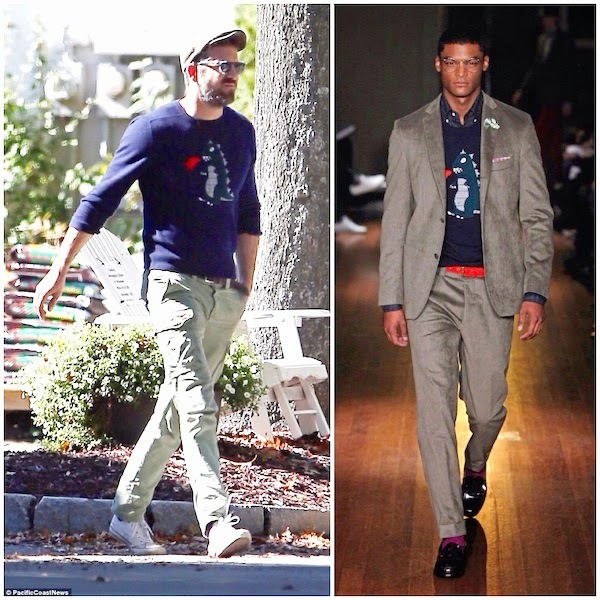 Ryan Reynolds wore a Godzilla / dinosaur print cashmere sweater from Michael Bastian Fall Winter 2014. How can anyone not love the fire spitting Godzilla knitwear from Michael Bastian? Love the simple pairing of the navy blue cashmere sweater, over cargo trousers and white Converse sneakers. A perfect example of daddy cool. That is right, Ryan Reynolds will soon have a little bundle of terror on his hands, although that one will not spit fire and climb over buildings in Japan. It was announced earlier today that Blake Lively and Ryan Reynolds are expecting a baby together. Many congratulations to them!